Orange Beach waterfront condo for sale at Mariner Pass.Welcome to Paradise! Furnished 3BR/2BA Unit includes a BOAT SLIP and Outdoor Storage Closet Downstairs. 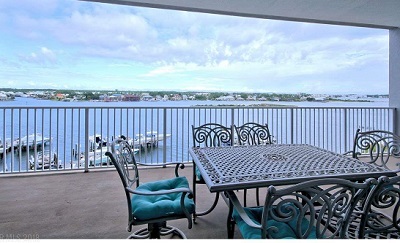 Enjoy the Amazing Views of the Islands surrounding Perdido Pass and Cotton Bayou from the Oversized, Private Balcony. Right outside the front door of the Unit is a Common Area Balcony where you can relax and enjoy views of Perdido Pass and The Beach! The unit has Granite Counters, Stainless Appliances, Tile throughout and is Beautifully Furnished. First Class Amenities include Indoor/Outdoor Pool, Hot Tub, Sauna, Steam Room & Exercise Room. This Low Density Complex will not disappoint. Complex is within Walking distance to The Gulf restaurant right across the street and San Roc Cay, Marina and Shopping! Everything you need is right here! Mariner Pass waterfront condos in Orange Beach is a low-density complex with 51 residences. The condominium is centrally located and convenient to dinning, shopping, etc. The community amenities feature an indoor & outdoor pools, steam/sauna room, BBQ grills, fitness facility and more. This resort property is near Perdido Pass and easy access to the Gulf of Mexico.